A date letter first appeared on English silver plate in the year 1697 as a result of legislation. In clause VIII of the Act 8 & 9 William III c.8 which, among other things, deals with the marks that must be applied to assayed plate at Goldsmiths' Hall the following wording is used: " .... and a distinct variable mark to be used by the warden of the said mystery (see note 1), to denote the year in which such plate is made;..." This legislation remained in place until 1999 in which year the Government adopted European hallmarking practice which does not require that an assayed item of plate must be dated (see note 1a). 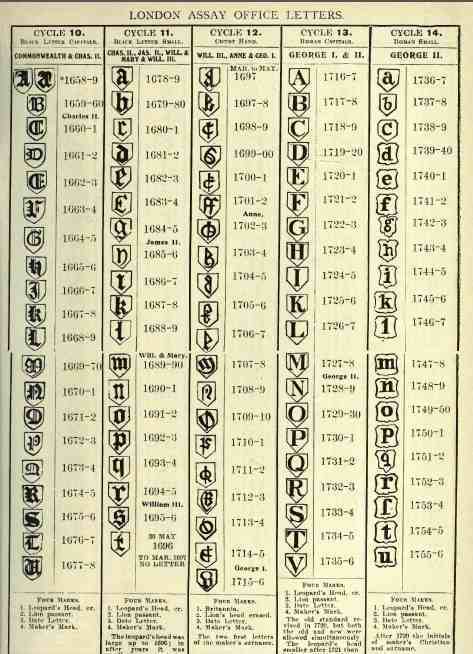 A similar system of alphabetical lettering had been used on English assayed plate since 1478 but that this system of lettering gave some date reference to the piece on which it appeared was purely coincidental. In 1423 by the statute 2 Henry VI. c. 13 "The Keeper of The Touch" or "Touch Warden", who was responsible for striking the leopard's head on all plate assayed and found to be of the required standard, became liable to a fine if an article so marked and found to be sub-standard, should come to light. This statute was reinforced by the statute 17 Edward IV. c. 1. which came into force on 16th. January 1478 and although "The Keeper of The Touch" was again mentioned as the responsible warden this time the other wardens were mentioned as well; ".......then for non-sufficiency of the said Keeper and Worker, the persons of the said craft of goldsmiths of the said city of London, by whatsoever name or names they be corporate, shall be chargeable and charged of the forfeitures by like action or actions of debt as is aforesaid in like manner and form as immediately before is specified." 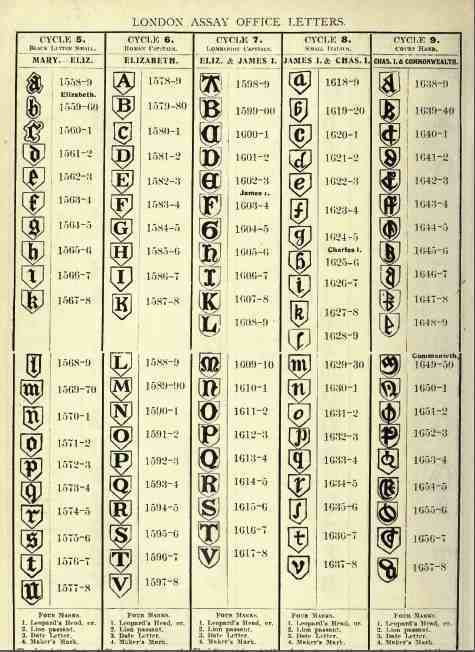 So that there could be no doubt as to who these wardens were, in any given year of election during which a particular item had been assayed, the Goldsmiths' Company decided that an additional variable mark of identification should be struck on all assayed wares and the mark chosen was a letter of the alphabet. It was further decided that every year a punch engraved with a new letter should come into use on the day of election of the new wardens and although, initially, this election took place on St. Dunstan's day, 19th. May, as he is the patron saint of goldsmiths, this date was not fixed. This new mark was variously called the "Assayer’s Mark"(see note 2) or the "Warden’s Mark" and the letters used were "A" to "U" omitting "J" as this could be too easily confused with "I". The Act that gave rise to this additional goldsmiths' mark was revived in 1487 for a period of 20 years by 4 Hen VII c 23 and again for another 20 year period in 1553 by 7 Edw VI c 6. 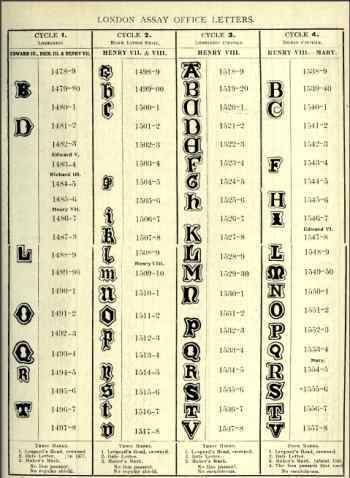 Although no further acts of revival were passed the practice of striking an alphabetical letter on plate was by then established and persisted. It appears that, because the election of wardens took place annually, this alphabetical letter became accepted as a date letter although the original intention was to relate it to the activities of the Goldsmiths' Company and not to the plate on which it appeared. It is, therefore, a misconception to believe that there was ever any intention that this new mark should be used to date the piece which had been assayed. 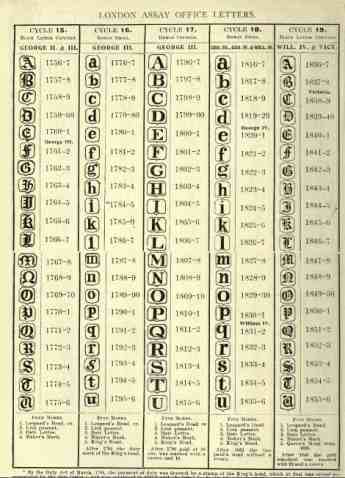 In 1560 it was referred to as "the letter of the year" and in 1597 as "the alphabetical mark". More recently it has been treated as if it were part of an unbroken sequence dating from 1478 to the end of the 20th century which it most certainly is not as this sequence was broken in 1697. Quite obviously it did not represent a calendar year and when used in this way should, properly, be shown to span two calendar years. Although there is a widely held belief that, until the 'Restoration', the re-election of wardens always took place on 19th. May of each year and that after Charles II came to the throne in 1660 it took place on his birthday which was 29th. May, this is not the case and, in fact, a range of dates between May and August can be found until the end of the 17th century. The 29th May was not regularly used until the beginning of the 18th. century when the statutory date letter had come into use and even then there were exceptions. (see note 3) It will be seen that, as the beginning of each marking year was variable, there are difficulties in using this letter as a date letter and this may be the reason why the date on which it was changed became more regularised after it was introduced by statute (see note 4). Until the end of the 17th. century the alphabetical letter was also used by the Goldsmiths' Company as a means of recording any change in their affairs by altering it in some way. Thus when, in 1561 the sterling standard was re-instituted for coin of the realm following its debasement by King Henry VIII, the alphabetical letter became enclosed in an escutcheon from 7th. January of that year because this affected the Goldsmiths' Company since the new diktat on the sterling standard did not allow for loss in cupellation. (see note 5) It was depicted in a changed way again when a warden was elected mid term because the original appointee had died or retired as is exemplified in the year 1567/8 in which the letter "k" was used both unembellished and with a pellet below because Richard Rogers was obliged to retire and his place was taken by Thomas Keeling. 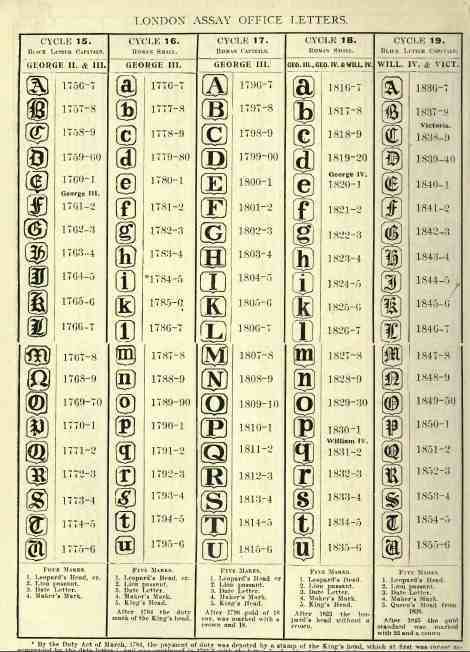 (see note 6) The letter "G" for 1664/5 also appears in two forms for a similar reason. Variations will also be seen in the years 1544/5, 1619/20, 1627/28 and 1638/39. A mystery change in thinking appears to have taken place in 1697, the year in which the new sterling standard, now known as the Britannia standard, was introduced. The letter identifying the wardens in office from 29th. May 1696 was the letter "t" and, instead of merely altering it in some way, when the new standard came into force on 25th. 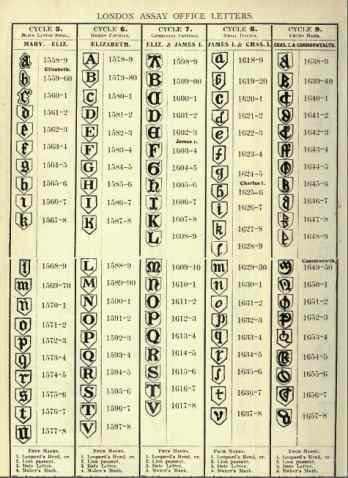 March 1697, in accordance with previous practice, a completely new alphabetical sequence was introduced so that from 27th. March 1697, i.e. before the marking year had ended, until the 28th May of that year, the letter "a" came into use. For some time it was believed that, not only had the letter "u" been omitted, but that the new sequence started with the letter "b" for 1697/8. It is now known however that there are pieces stamped with the letter "a" and as this letter was only in use for two months such pieces are quite rare. It should be noted that, although the 1697 Act came into force on 25th. March the new letter was not used until 27th so that for two days there was no marking. This was because the 25th and 26th March on the Julian calendar in use in England at the beginning of the 18th century were Saturday and Sunday when the assay office was not open for business. My only thought is that the reason for this anomaly is probably that the ceremony at which the punches were broken always took place at the end of the marking year. This being the case the punch for the letter "t" would have still been in the assay office until 28th May and therefore available to be used in error! It seems from this that the Court was unaware of the decisions taken by its predecessors some half a century earlier and the resultant interruption in the alphabetical letter sequence. The first two of the dates quoted in this minute are quite wrong and they arrived at the date 1696 merely by counting back from 1756 and applying the knowledge that the letter "b" had been used for the marking year 1697/8. In 1697, when the new sterling standard (Britannia standard) was introduced, the alphabetical letter was given legal status for the first time and by that date had been accepted, by those responsible for the legislation, as nothing other than a date letter as is shown by the wording of the Act as shown above. Since this letter had become accepted as a date letter at this time it is strange that the opportunity was not taken to relate it to the calendar year. Indeed it is even more strange that it continued to represent a period of twelve months which bridged two calendar years into the late 20th century. A possible explanation for the complete departure, by the Goldsmiths' Company, from previous practice following the introduction of the 1697 Act could be in the wording of that Act. The last year in which the alphabetical letter was related solely to the election of the wardens was 1696 represented by the letter "t" and I feel that it is possible that had the "distinct variable mark" not been mentioned in the 1697 Act, the letter "t" might well have appeared in an altered form to mark the fact that the standard of fineness for silver had changed. The wording of the Act, however, specifically related the "distinct variable mark" to "the year in which such plate is made"(see note 9) and thus divorced it from the election of the wardens. It was therefore a new statutory mark which happened, by coincidence, to be similar to that previously used by the Goldsmiths' Company for their own purposes. 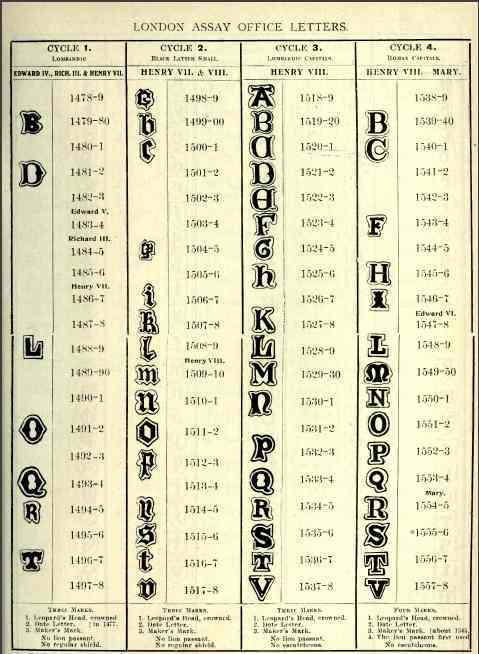 The Goldsmiths' Company may well have considered it desirable to make a clean break with the old system in order to show that the new had no connection with the election of its wardens and if this were the case the use of a completely new sequence of letters is easily explained. Apart from changes in the shield outline no embellishment has been used with the "date letter" since its inception in 1697 when it became a date letter and not related to the Company or its Wardens. It is interesting to note that both Chester and York, the only two provincial offices which used recognisable alphabetical sequences before 1697, also broke off the letter sequences they were using and started new ones in 1701, as soon as they were covered by statute. I am grateful to the Worshipful Company of Goldsmiths for extending to me the privilege of examining their records. note 1: In medieval England and, in fact, until quite recently the Guilds of London were known as 'mysteries' presumably because to belong to one an apprentice had to learn a craft which was not known to those outside his Guild and was therefore a mystery. The word 'mystery' merely means 'craft'. note 1a: In spite of this I am glad to say that the Goldsmiths' Company still applies a date letter to items assayed by them. note 2: This term was still being used in 1513 when it appeared in an ordinance of the Company dated; 5 Henry VIII. note 3: John S.Forbes. Silver Society Journal No12. p.83. note 4: Apart from a handful of exceptions, as mentioned above, and an occasional variation of a day either way, which presumably accounts for Sundays, between 1700 and 1974 the date on which the date letter was changed was always 29th. May. It became 1st January from 1975 onwards. note 5: Cupellation is the method of assay by which the sample, known as the drawing, to be tested is wrapped in lead and put into a small cupel, which is then put into a furnace and raised to a temperature at which the lead and impurities are absorbed into the cupel thus allowing the pure noble metal to be separated from the base metal with which it had been alloyed. This can then be weighed and this weight compared with that of the original sample in order to determine the percentage of pure silver in that sample. The drawback with this method is that some 2dwt of fine silver in the pound is "lost in the fire" ! 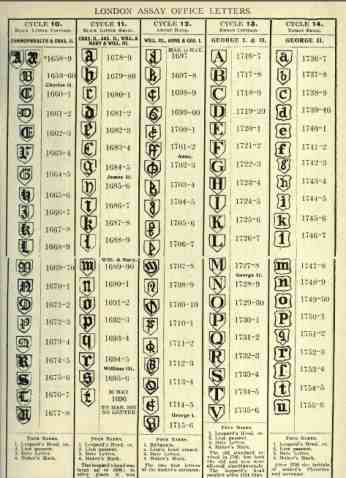 note 6: John S. Forbes-HALLMARK A History of the London Assay Office-Unicorn Press 1999-p.70. note 8: Court Book 16 (Goldsmiths' Hall) 8th. April 1756 p69. note 9: The wording "the year in which such plate is made" was, it could be argued, meaningless as it did not relate to a calendar year.